I’m taking a short break from the painting to show a tip for using binder clips in the studio. I use them to keep my paint tubes organized, or for hanging sheets of paper or canvas. You can buy these at an office supply store in various sizes. These are “medium” size, 1.25 inches. To slip the clip over the plastic hanger, I squeeze the metal handle and remove them from the clip. I then slide them over the hanger, and squeeze them back on clip. I can now place the hanger on a rod and clip the bottom ends of paint tubes to them. 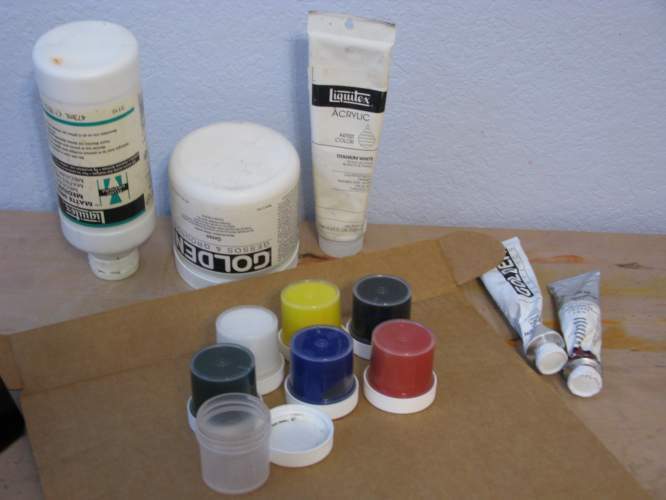 This allows me to organize the paint by medium or paint color – however I need them. 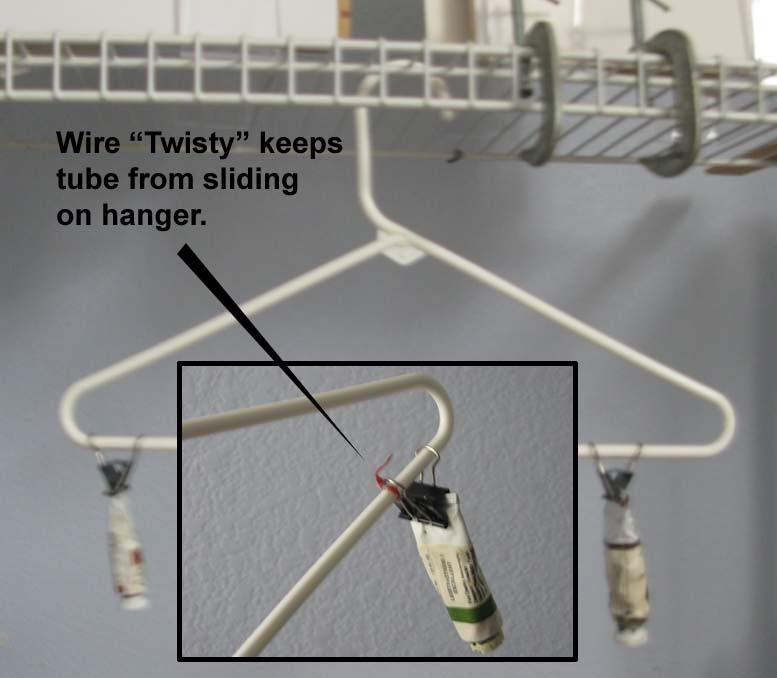 To keep them from sliding down the hanger, I can tie a wire “twisty” on the handle. The clips are strong, and will hold even a large tube of paint. 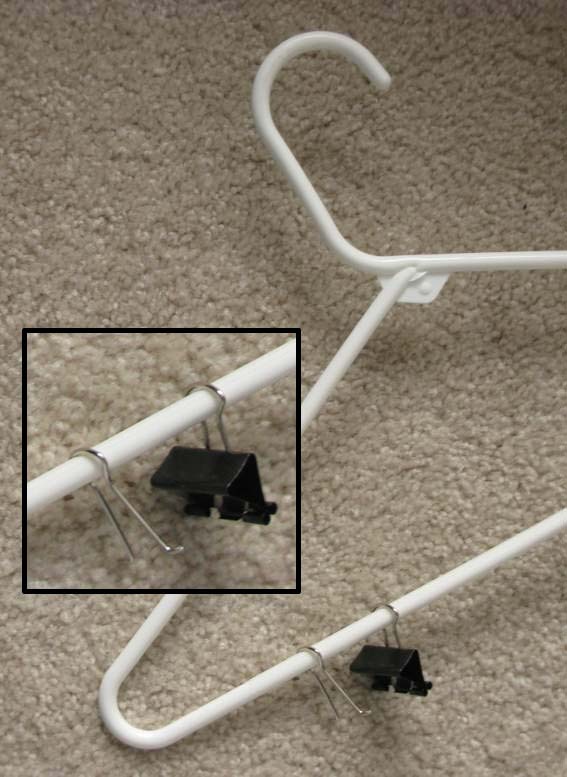 Alternatively, with this particular type of metal shelving I have, I can slip the clips over the metal rods, and not use hangers at all. 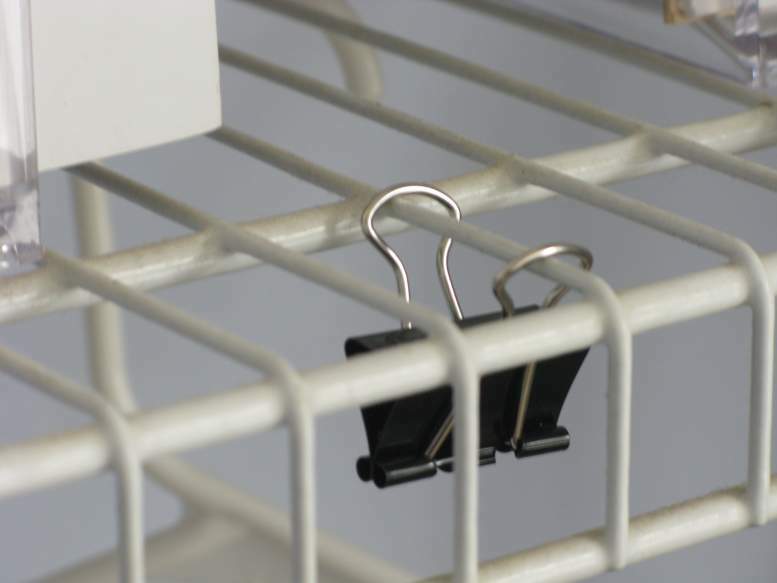 You can also get some peg board hooks at a hardware store, and slide the clips on those. 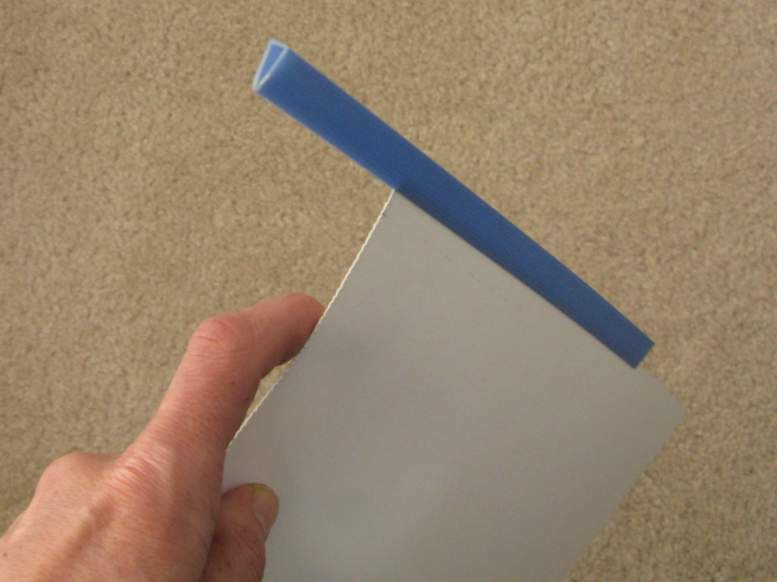 Another use for the clips and hanger is to hold sheets of paper or canvas using these plastic “slide-grip” binders sold for report covers. They’re less likely to damage the sheets than the metal clips themselves, and will keep the sheets straight. 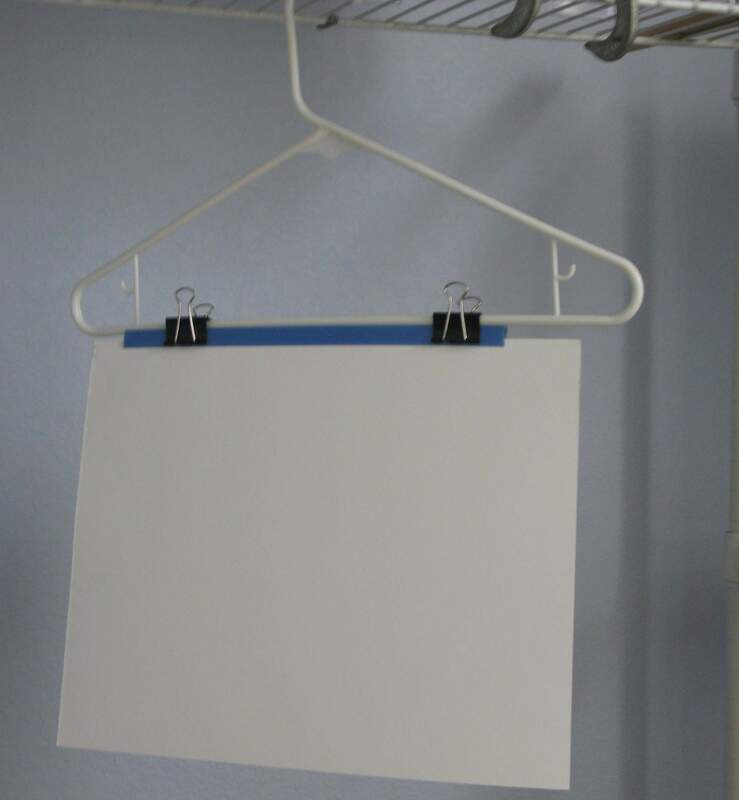 This can be especially useful for wet surfaces that that need to dry. With the painted side facing the wall, dust is less likely to get on the surface. 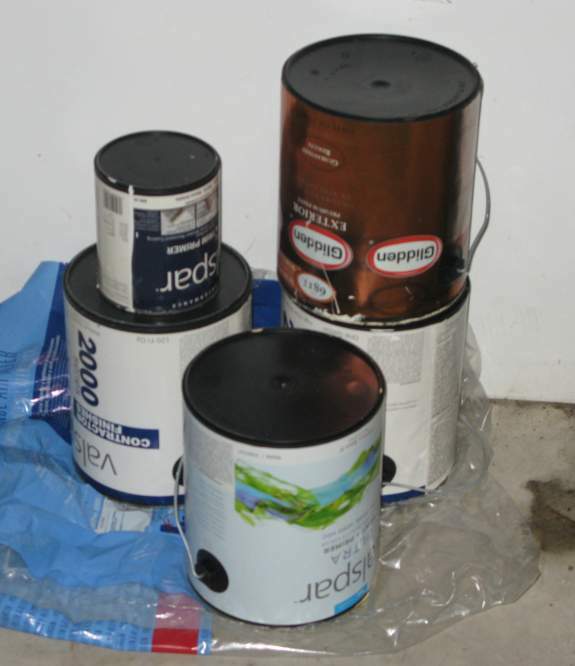 Some fatherly advice I received years ago from dear old Dad was to store my containers of liquid, in particular cans of paint and such, upside down. 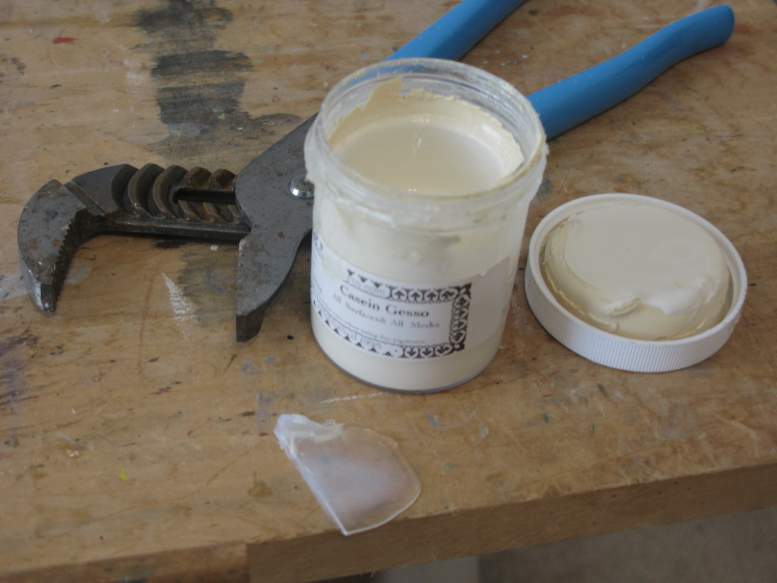 The demon of air will dry out paint, or cause it to get a dry skin layer inside the can as air that penetrates through the lid. However, when the wet liquid presses against the inside of the lid there’s less air to dry it out, and the paint will last longer. In this photo above you can see a few small plastic jars of some recently made gouache paint turned upside down on their lids. This is how I store them. Sometimes I put labels on the bottom. Behind them is a jar of Golden Acrylic Gesso, a bottle of acrylic medium, and some paint tubes. The bottle of medium is a little unwieldy on its cap, so I have to place it in a drawer in such a way that it won’t tip over, usually against other similar bottles stored in the same way. The paint tubes can be a problem since most manufacturers use very small caps that won’t let you balance the tube upright. Liquitex tubes are nice and large for that, but not most other brands. Alternatively, you should squeeze the tubes from the end, forcing the paint to the top and get the same benefit. This is also a good way to store any cans of left over house paint you might have in the garage. Be careful of potential leaks, however, and put a plastic sheet underneath, just in case. The motivation for this post was my reading that Golden is going to start labeling their cans upside down to encourage people to get use to this way of storing their supplies. Good for them.